Grants will be awarded for projects that reduce or minimize pollution and protect clean water in the 85 municipalities along the length of the pipeline corridor. Projects to educate future generations about water resource protection, such as demonstration projects that showcase pervious pavement, stormwater runoff management features and systems, bioretention systems, constructed wetland complexes, stormwater runoff collection and reuse projects, stormwater mitigation projects that reduce rate and volume and improve water quality on a school or other public property. 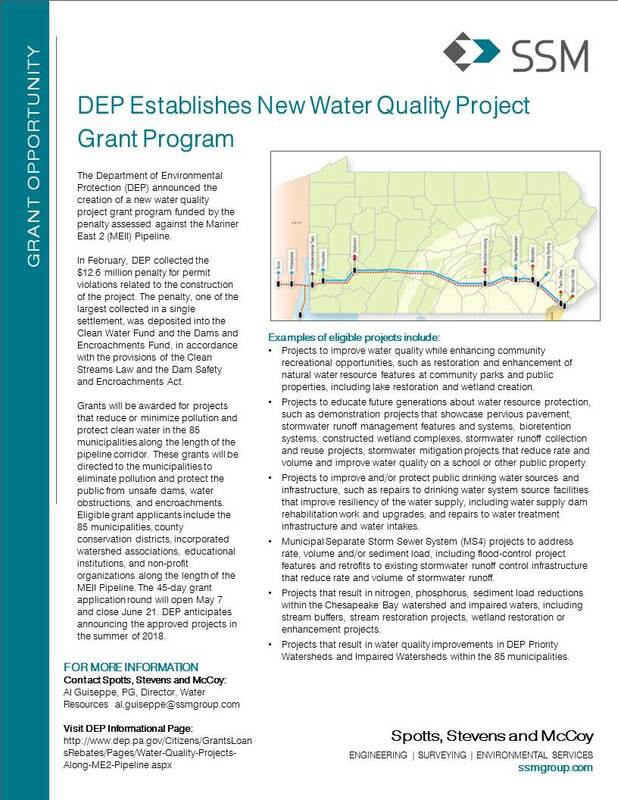 The Department of Environmental Protection (DEP) announced the creation of a new water quality project grant program funded by the penalty assessed against the Mariner East 2 (MEII) Pipeline. Grants will be awarded for projects that reduce or minimize pollution and protect clean water in the 85 municipalities along the length of the pipeline corridor. These grants will be directed to the municipalities to eliminate pollution and protect the public from unsafe dams, water obstructions, and encroachments. In February, DEP collected the $12.6 million penalty for permit violations related to the construction of the project. The penalty, one of the largest collected in a single settlement, was deposited into the Clean Water Fund and the Dams and Encroachments Fund, in accordance with the provisions of the Clean Streams Law and the Dam Safety and Encroachments Act. Eligible grant applicants include the 85 municipalities, county conservation districts, incorporated watershed associations, educational institutions, and non-profit organizations along the length of the MEII Pipeline. The 45-day grant application round will open May 7 and close June 21. DEP anticipates announcing the approved projects in the summer of 2018. Eligible applicants can apply via the Commonwealth of Pennsylvania Electronic Single Application website. Questions should be directed to R. Scott Carney, Chief Watershed Support Section, 717-783-2944.